Peter "Pete" Seeger (born May 3, 1919) is an American folk singer and an iconic figure in the mid-twentieth century American folk music revival: A fixture on nationwide radio in the 1940s, he also had a string of hit records during the early 1950s as a member of The Weavers, most notably the 1950 recording of Leadbelly's "Goodnight, Irene", which topped the charts for 13 weeks in 1950. Members of The Weavers were blacklisted during the McCarthy Era. 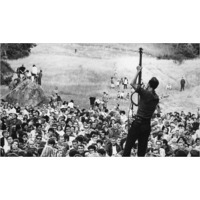 In the 1960s, he re-emerged on the public scene as a prominent singer of protest music in support of international disarmament, civil rights, and environmental causes. As a song writer, he is best known as the author or co-author of "Where Have All the Flowers Gone? ", "If I Had a Hammer (The Hammer Song)" (composed with Lee Hays of The Weavers), and "Turn, Turn, Turn! ", which have been recorded by many artists both in and outside the folk revival movement and are still sung throughout the world. "Flowers" was a hit recording for The Kingston Trio (1962), Marlene Dietrich, who recorded it in English, German and French (1962), and Johnny Rivers (1965). "If I Had a Hammer" was a hit for Peter, Paul & Mary (1962) and Trini Lopez (1963), while The Byrds popularized "Turn, Turn, Turn!" in the mid-1960s, as did Judy Collins in 1964. Seeger was one of the folksingers most responsible for popularizing the spiritual "We Shall Overcome" (also recorded by Joan Baez and many other singer-activists) that became the acknowledged anthem of the 1960s American Civil Rights Movement, soon after folk singer and activist Guy Carawan introduced it at the founding meeting of the Student Nonviolent Coordinating Committee (SNCC) in 1960.